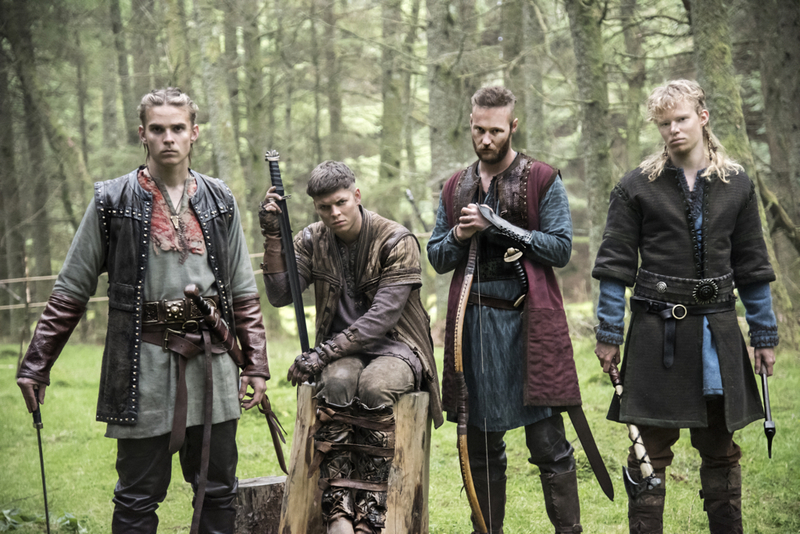 Vikings jumped ahead about a decade during its recent Midseason 4 finale, introducing a quartet of new actors to play Ragnar Lothbrok’s now-grown sons. Marco Islø now stars as Hvitserk, Alex Høgh Andersen is Ivar, Jordan Patrick Smith plays Ubbe and David Lindstron is Sigurd. Let’s learn a little more about the actors and their characters. In “The Last Ship” episode, Ragnar’s sibling rivalry with brother Rollo (Clive Standen) ended with Rollo’s Frankish forces defeating the Vikings and sending them back to Scandinavia. The outcome wasn’t shocking for history buffs, but series creator and writer Michael Hirst still managed to surprise. His sons seemed to have mixed feelings about their dad when he returned at the end of the episode. They obviously resent him for leaving them, but still they are proud of his accomplishments. Crazy Ivar seemed absolutely giddy he was back and challenging his sons. Keep the ax away from that one, Ragnar! “Vikings” will return later this year with 10 more Season 4 episodes. In the show: Ubbe is the firstborn son of Ragnar and Aslaug. Earlier in the season, young Ubbe (as played by Luke Shanahan) tracked and spotted Floki (Gustaf Skarsgård) when the shipbuilder fled Kattegat. Historically: According to the old Norse story “The Tale of Ragnar’s Sons,” Ivar was the firstborn of Ragnar and Aslaug, followed by Bjorn, then Hvitserk, then Sigurd. Other Norse sagas list a different set of brothers, including Ubbe and Halfdan. In these stories, Ubbe was one of the Viking leaders who invaded the Anglo-Saxon kingdoms in what is now England. Let’s call this artistic license, as Hirst seems to be mixing sources. Historically: In “The Tale of Ragnar’s Sons,” Hvitserk fought alongside his brothers for years and at the death of their father, took control of Jutland, which is modern day Denmark, and Wendland, now part of Germany. In the show: Sigurd was born with a birthmark in his eye and became known as Snake-in-the-Eye. Aslaug prophesied her third son would bear the mark of Fafnir, the serpent-dragon her father killed. In Season 4, Sigurd tricked Aslaug into seeing that the wanderer Harbard (Kevin Durand) was bedding many of the women of Kattegat. When he discovered Bjorn’s daughter Siggy had drowned, he told his mother who, along with Ivar, didn’t seem to care. Historically: Sigurd might have endured a lot so far in Season 4, but according to “The Tale of Ragnar’s Sons” he eventually rules the Danish island of Zealand, the now Swedish provinces Skåne and Halland, as well as several areas in what is now southern Norway. He married the daughter of the Northumbrian king who is said to have had Ragnar killed. Andersen, like Ilsø, is a Danish actor. His TV credits include “Tvillingerne & Julemanden,” “Hedensted High” and “Outsider.” At age 11 in 2006, he appeared in the competition series “Scenen er din” (“The Stage Is Yours”) but was eliminated in the semifinals. He showed great confidence and strong opinions in the midseason finale. His brothers’ reactions to him suggest they consider him a bit of a wild card, and maybe a bit dangerous. Ivar likely will be the most traditional Viking of the brothers because he was taught their ways by Floki (Gustaf Skarsgård) at Aslaug’s request. He hinted at Floki’s influence in the midseason finale. “You all sound like a bunch of Christians,” he told his brothers when they discussed Ragnar’s shortcomings. Historically: Whether or not he actually had a disability, Ivar the Boneless managed great things, according to “The Tale of Ragnar’s Sons” and other Norse sagas. He led invasions, ruled the Vikings for a time and even ruled over northeastern England. Interpretations of his “Boneless” name range from Ivar not being able to walk to his having unusual flexibility. The Siggy who drowned wasn’t Björn’s daughter. Björn and his wife named their daughter after the Siggy who drowned. Yes, Siggy the daughter was named after Siggy the adult, who did drown. Sigurd found Bjorn’s daughter Siggy dead on the bank of a stream, suggesting she also drowned. I believe, from the way the episodes prior and that episode were filmed, that Ivar drowned her.